-“I had a customer tell me there’s a rainstorm coming, that there will be all these clouds and none are going to talk to each other”. Aren’t these statements making you curious, the word CLOUD , the way people speak about it? – How do we achieve mission assurance on the same network? – How do we ensure the network is there when we need it? – What approach should we take? A style of computing where massively scalable (and elastic) IT-related capabilities are provided “as a service” to external customers using Internet technologies is called the CLOUD. The “Cloud Concept” built upon the three pillars of current computing system such as “Infrastructure”, ”Platform” and the “Software” or applications. The business benefit of “Cloud” is, its’ use to provide “On demand Service” which helps to full fill the demand of chain execution can be the cause of reducing expenses of implementation of multiple processing units. Cloud provides the concept of updating of resources without affecting the underlying infrastructure, which reduce the need of backup system and encourage the continuous execution of application. Cloud provides potential “Reliability” and “Scalability” for the applications either deployed or are running on cloud. Since, cloud use to assure out most security for any business application, it provides a “Private Cluster” for each application. Also we can say CLOUD as Infrastructure provided by the service provider to build internet application. Here we can use software that are pre installed in the cloud, so that we don’t have to install the software in our pc and waste spaces. This means providing, working environment virtually using cloud. That means we can gain access to a virtual device in cloud which is similar to hardware to achieve our task. Eg:- We can use Apple Iphone virtually even though we don’t have it in our hand.Similarly there are virtual Desktop and many other devices too, according to the service provider and purpose this changes. Here platform is provided to the user, so he does not have to worry about the platform.So this is platform independent.So you don’t have to worry about whether it will support Linux, Windows or Mac.All you need is a web browser. Here we are storing all our data in CLOUD(Actually in a Server), so we don’t have to store the data in our pc, which is less secure and may be lost if some problem occurs, like system crashes.So by storing our data in CLOUD Database we can save space, and can avoid unwanted problems. Software plus Service is similar to SaaS, but it has some extra features, like payed users will have more, access options or similar extra facilities. Out of these SaaS, PaaS, IaaS are the main Services. 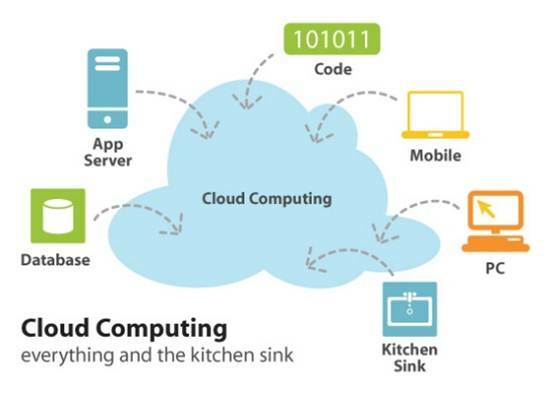 So this is the basic over view of CLOUD computing. Hope You Guys Got Some things out of this Post…..!